I haven't been writing much in the last few weeks. See, my primary purpose here is to relate my experiences as a (relatively) new pet parent in the hopes that people will learn something from me. The only problem is I've had so much trouble with the dogs that I feel like I have nothing to give you. Does she mean us, Lulu? I want to yell it from the rooftop! My dogs are driving me nuts! But does my yelling really matter to them? No! I'll explain why in a moment. What's happening? They won't stop peeing and crapping in the house! And that's just the biggest problem. Lulu is easier to deal with -- she just needs to get used to the new grounds. It's taking her longer to find the right spot. But she finds it eventually. You call this easier? She rolls in the grass! Jasmine, on the other hand, has never been properly trained. She has something of a routine: Mom would wake up at 5, feed her and Buster in their crates around 6, and let them outside. And they would stay outside until Dad was ready to let them in before going to work. When they got home, the dogs would go out, sometimes hours at a time. That's way different from my schedule: I wake up around 8, take them out on a walk, then feed them. And Jasmine won't follow that plan. She won't go to the bathroom until she's been fed. And if I leave her in the crate while I walk Lulu, she'll just go there. And she doesn't tell me if she has to go! Is that a dog in your iPad? And every time I find her mess I want to yell and scream at her, but what's point? See, I yell to release frustration. I yell because my dog has pissed me off. All the dog knows is they're being yelled at. 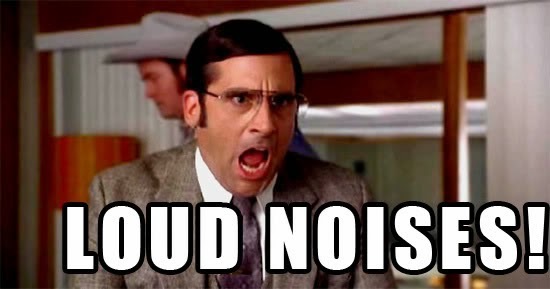 If you're yelling because they JUST pooped on the carpet, they MIGHT know they messed up. But then how do you remedy it? Putting their nose in it is useless, trainers say. Immediately take them outside, but by then they've already gone. If your dog pooped even 10 minutes before you find it, they won't even know why they're being yelled at, likely. 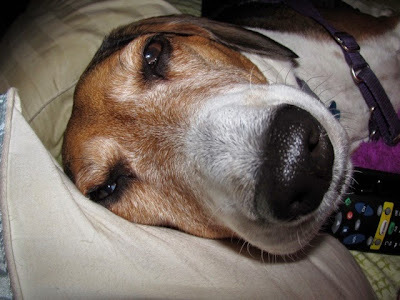 A dog has maybe a 10 to 20 second short term memory. And you can forget about remorse. Numerous studies have found that sad guilty look as little to do with their actions and everything to do with the tone of your voice, the energy your throwing off. So... there's no point in yelling. On Saturday, Jasmine starts class. We hope to iron the issues out. But what do you do when your dog is so stubborn that the usual measures to find a routine don't seem to work? Editor's Note: Keep reading to find out the winners in the Lulu's Favorite Things campaign so far. Hello all, Galadriel here, and I'm NOT happy. Servant brought a new beast into the house. Servant calls her... Jazzzmeen or Yasmine or some such. (ED. It's Jasmine) For the sake of sanity, she will now be known as Beast #2. Servant said Beast #2 comes from the Servant's parents, who could not care for her. Servant has a little human who comes over sometimes, and this beast is belongs to Servant's little human. What is she? I don't know, besides a terror. She's pushy, and hyper. She gets Beast #1 all hyper too, and look what they do together! And they don't just do it outside, they do it in the house too. I have been on the attack though. She doesn't just get by. Servant caught me stopping Jasmine from getting into the living room. I have done this with Lulu before. I can be very, very intimidating. And here I am making Beast #2 know she can't just walk past me without my permission. However, Beast #2 is starting to fight back. We have gotten into it, usually when I try to get close to Servant. She usually defends me from Beast #2. Then I go to my safe spot, which is the bathroom. that's where all my stuff is. No one bothers me there. And no one bothers me outside on the patio either. Servant says she will get Beast #2 trained. But until then, I may just live outside. I feel so natural out there... so alive! 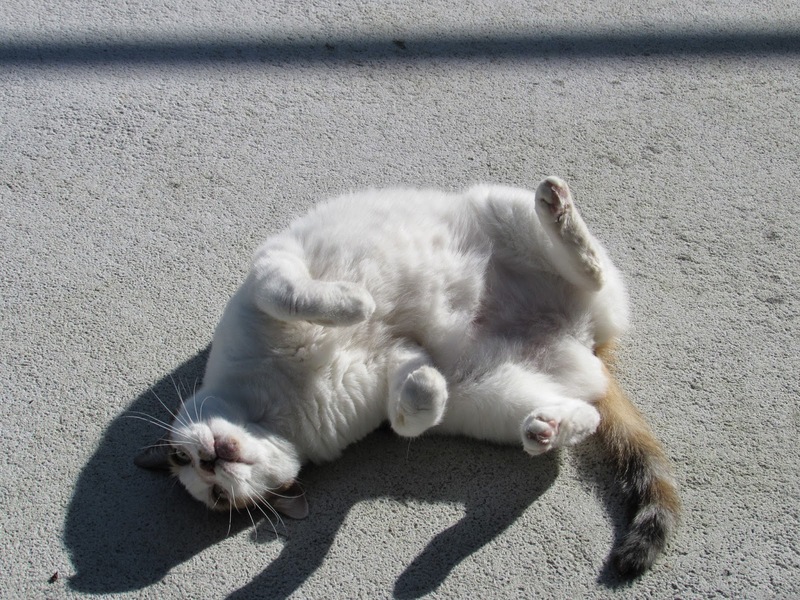 TELL US: What's your multi-pet household story? 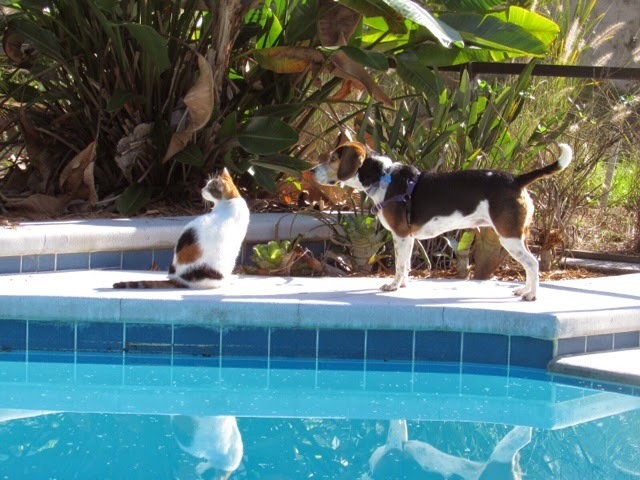 How did your pets get to know each other? Are they all friends. WINNERS: Lulu's Favorite Things giveaway! So far we've had three Lulu's Favorite Things giveaways. It's time to pick the winners for two of them! GoDog Giveaway: The winner of the two goDog toys is Savanah Rae. Jones Natural Chews giveaway: The winner of the variety bag is Lisa F.
Stay with us! At the end of the month, we will choose the winner of the Zuke's Pet treats. Have you entered yet? ENTER NOW! There's one in every family: the weakest link. That's my Dad in my house. He's the one the dogs go to at dinner time because they know they'll get a little something-something from the table. And sure, table scraps are ok once in a while, but when the dog is on a balanced diet you don't have to go crazy. I mean, I came home from a business trip once (I seem to remember I was returning from a BlogPaws), and I went to pick up Lulu from their house, and there he was, standing in the kitchen doorway, absent-mindedly feeding Lulu Cheetos. "But she likes them!" he responded to my cries of protest. 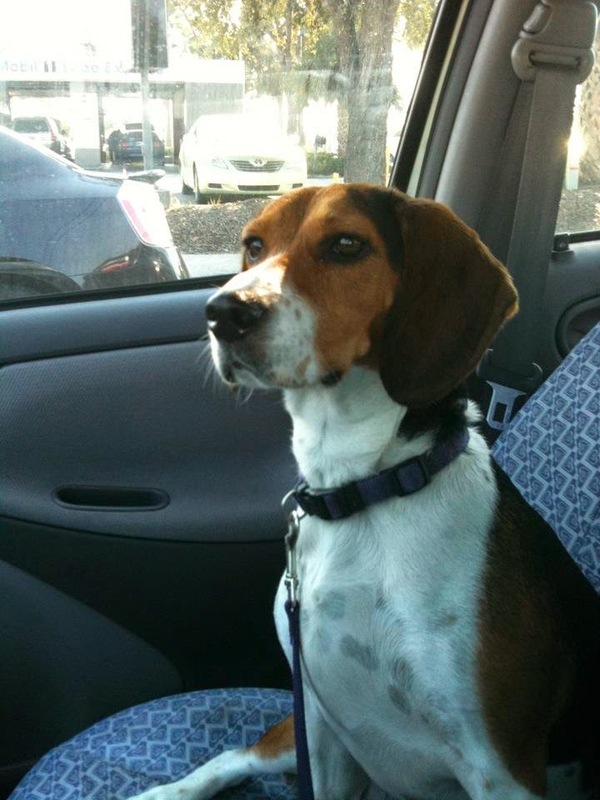 And I get it -- you have to have willpower to be a beagle parent. Hi, I like breakfast. Can I have breakfast too, Mom? Beagle eyes are big and sad and the damn dogs use those powers for all kinds of evil. Hard to resist. You just want to make them happy. And in a society where we celebrate food, it's easy to dole out a few extra treats, isn't it? But you are actually doing more harm than good. If you're not careful, before you know it, you could have an overweight dog or an overweight cat. 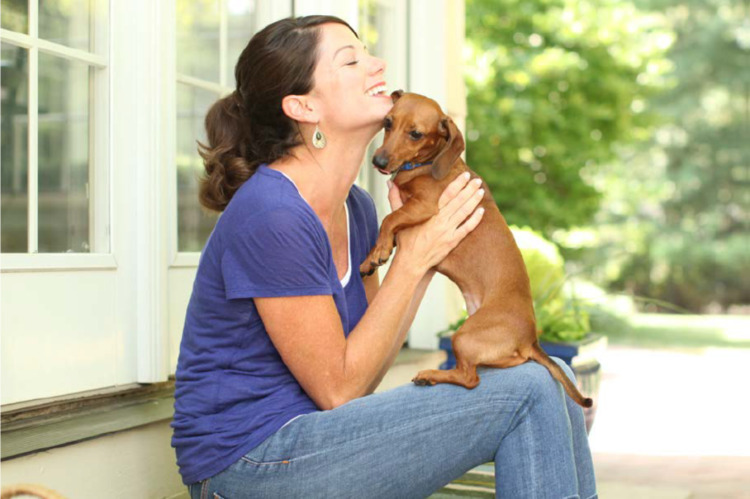 Even I was shocked when a pet fitness expert told me Lulu could stand to lose a couple pounds. WHAT?! But I'm so good at controlling the urge to give her treats! But maybe not as good as I could be. According to the Association for Pet Obesity Prevention, in the US, 53 percent of dogs and 55 percent of cats are now overweight or obese. Even if you think your pet is perfectly fine, it might be time to get a second opinion. At least, not the treats and the extra food and the human table scraps... and DEFINITELY not the Cheetos. And if your vet suggests using a weight loss formula food, and you trust your vet, listen to them. Hill's Metabolic Advanced Weight Solution is a weight loss diet for dogs and cats. They have a complete line of food (canned, dry and treats) that so far has proven to help overweight dogs and cats lose weight safely. Hill's wants to help people get their dogs on the right track -- that love for your pet should not be defined by how much food you give them, but how well you help them maintain good health, and that includes a healthy weight. So they are offering to help you pay for that vet visit to talk about a weight loss plan for your dog or cat. If you fill out the following form, you can sign up for a $25 rebate, good toward a wellness visit with your vet. Then you can ask all the questions you might have about your pet's weight and whether they should go on a diet. Here's the form to sign up for that rebate. In addition, if you do need a special diet food, Hill's will give you a $25 rebate toward Hill's Metabolic Advanced Weight Solution. So that's $25 towards the vet visit, plus $25 towards the food. Not bad. And, you can share it with your friends and family. Go ahead, spread the word! In the meantime, think about these things when you want to show your pet love. Even the most food-hungry hound will want your attention over a treat. That's what our pets really want. Spend time with them. 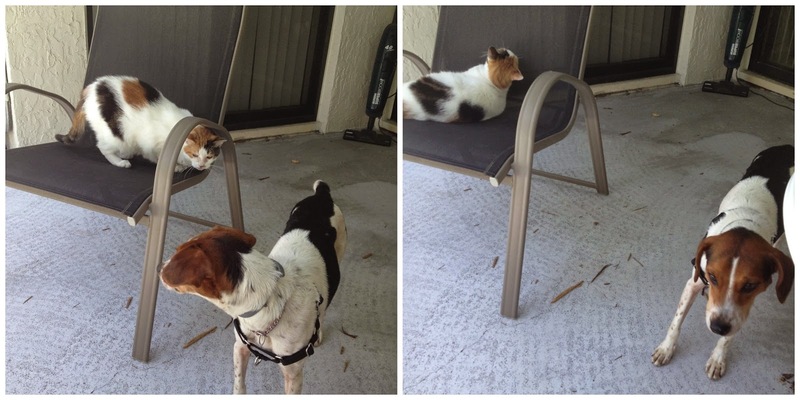 Go on walks, throw the ball around, or just sit with them and pet them and talk to them. Did you know that petting a dog can release endorphins -- both in your pet's brain and in your own. It makes you both feel good. Especially if you scratch behind the ears. Dogs have lots of nerves in their ears and scratching behind them makes them feel really good. It makes them very, very happy. Lulu is so happy when she gets to ride in the car. Maybe that's what we'll do next time, instead of an extra treat. I wrote this piece for Weichert, Realtors Hallmark Properties. It appeared on their website Monday. Weichert is sponsoring the post, but all the ideas in it are my own. 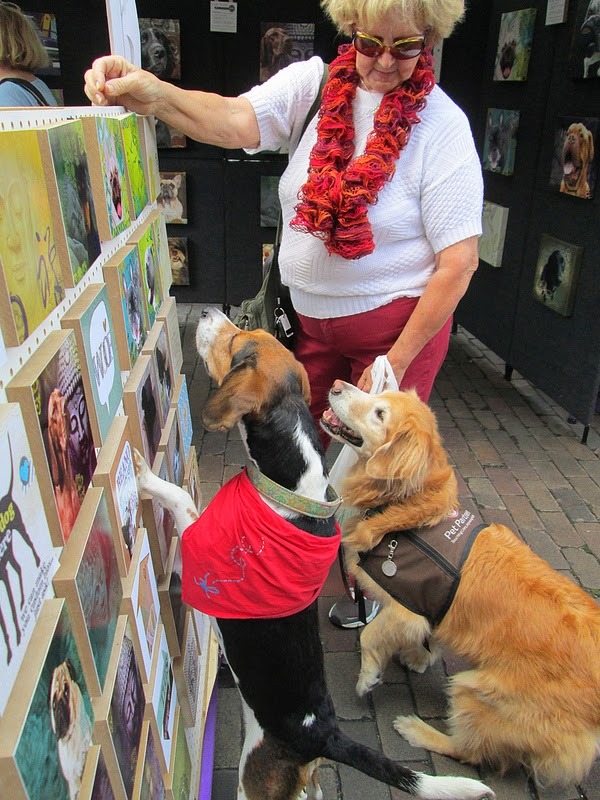 If you were to spend a typical Saturday in Downtown Winter Park, chances are you’re going to encounter a plethora of dog owners with their fellow companions. At the city’s famous farmer’s market, you’ll probably see at least a dozen dogs there alone. The Winter Park Farmers Market is every Saturday. In addition to seeing several dogs in Winter Park, I’ve seen people walk with birds on their shoulders (or in strollers), cats on harnesses, and I even saw one man with a rabbit at the recent Doggie Art Festival (how this rabbit survived is truly a testament to both the dogs and their owners). 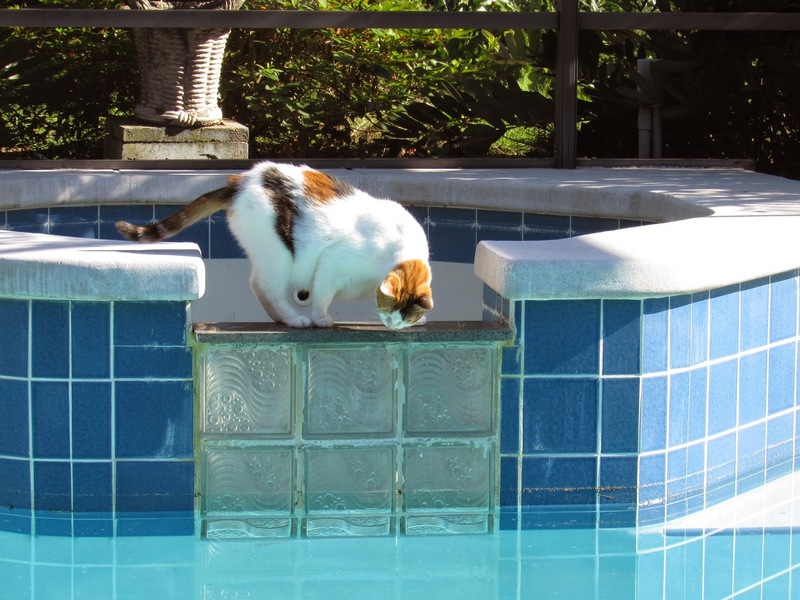 Why is Winter Park so pet-friendly? Judy Charuhas is a co-founder of Winter Park Lost Pets.com and has lived in the city since 1983. Brian Wettstein is part owner of The Doggie Door on Park Avenue, a pet-friendly boutique. Lulu takes in the Doggie Art Festival. 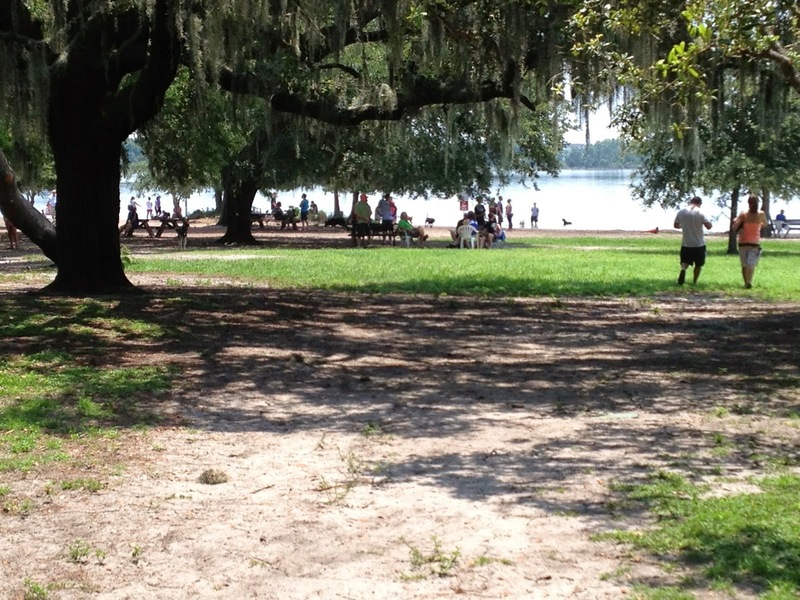 Fleet Peeples Park: This 13-acre park sits on Lake Baldwin. Pets can run and swim to their hearts’ content, and if you are worried about your little guy playing with the big dogs there’s now a small dog area. There’s also a dog washing station, bathroom, and on-leash nature trail. Pookie’s Bow Wow Bakery: Since 2002, Pookie’s has served the Central Florida community by offering all-natural and organic foods, treats, and supplements for pets. If you can’t get to the store on Fairbanks Avenue, Pookie’s has a home delivery service. The owners of Pookie’s also host rescues to help find homes for pets. Each year, Pookie’s hosts an annual fundraiser and pet adoption event called RescueFest at nearby Lake Lily Park in Maitland. Woof Gang Bakery: Woof Gang Bakery may be a chain, but unlike other locations, the Winter Park store is a big, beautiful boutique for chic dogs. They sell homemade treats, the centerpiece of the Woof Gang brand. They also have grooming and doggy daycare in the store. The store is located on Orange Avenue, not too far from Fairbanks. Hip Dog Canine Hydrotherapy: Could your dog use some time in the pool? Maybe it needs to lose weight, arthritis, or another condition that means they can’t walk as much. Or maybe your dog just wants to go for a swim. Hip Dog gives owners a place to take their dogs so they can get their swim on. The hydrotherapy center has been around since 2001, off Palmetto Avenue near the Orange-Seminole county line. Hip Dog is by appointment only. Park Avenue in Winter Park. Downtown Winter Park Business District: Park Avenue and Hannibal Square are very pet friendly areas. Water bowls can be found in front of most stores as you and your dog stroll down Park Avenue. Dogs are welcome on patios and in front of most sidewalk cafes. Pets are also allowed in many stores, and some even have store pets. There are few places on Park Avenue where pets aren’t allowed though, and Central Park is one of them. But even that is changing. Last year the city council voted to allow two pet events in the park a year. Wettstein’s Doggie Door sponsors those two events – the Doggie Art Festival and the Pet Costume Contest that finishes with a pet trick or treat on Park Avenue. Other pet-friendly events around Park Avenue include the Running of the Chihuahuas, which just happened on May 4. If you haven’t taken your pet to Winter Park, you’re missing out on all the fun! Zuke's Pet Treats is one of the sponsors of the Lulu's Favorite Things Campaign, which raises money for Harbor House of Central Florida's Paws for Peace Walk. Thanks to the help of companies like Zuke's, we raised $500 for Harbor House. You can continue to help us raise money by going to the Harbor House website. And keep reading for our great giveaway below. We are all constantly looking for new and better treats for our pets, aren't we? And lets be honest, Lulu's never met a treat she didn't like. Or anything edible, really -- and sometimes her idea of edible and mine don't mesh. So it's up to me as the parent to kind of move her toward treats that won't make her sick... or fat. I actually started buying Zuke's treats for my cats, because some have glucosamine, which is good for joints. But I found Zuke's can be great training treats too. These Lil' Links are great for training your pet. They are small, but they are a little stinky, and they can be broken up. Or you can just use them as high-value treats. I also like them because the ingredients are limited. Zuke's honored me by letting Lulu and Jasmine try the new Duck and Apple flavor that is coming out! And you know what the first two ingredients are? Duck and apple! Maybe 17 ingredients go into each treat! So not a lot of preservatives, which is great if you're watching what your dog is eating, or are worried about allergy issues. And they're grain free. "All natural ingredients, all sourced in the USA (except our rabbit and venison which come from New Zealand), with final products made in the USA." Plus duck is a great protein if your dog has an intolerance for regular proteins, like chicken. Of course, if your pet likes chicken treats, you can get Chicken and Apple Lil' Links too. They also make them in Pork and Apple and Rabbit and Apple. Zuke's has lots of other treat lines, in case you are looking for something else. Lulu also likes their Hip Action peanut butter treats, which have glucosamine. And if your dog could lose a little weight, there's the Skinny Bakes line too. You can also follow Zuke's on Facebook, Twitter and Pinterest! Now, here's your chance to win a set of the Lil' Links line! Four bags -- one of each of the chicken, rabbit, pork and the new duck treats, will be shipped to your house from Zuke's! Just fill out the RaffleCopter below. The question -- what kind of treats do your dogs like? There are others ways to get entries as well! So enter today. The contest ends June 1. The fine print: This post is sponsored by Zuke's. I am being compensated for helping spread the word about Zuke's, but we only share information we feel is relevant to our readers. Zuke's is not responsible for the content of this article. Do you have kids at home (the two-legged, non-furry kind)? If you're like me and you only have the furry kind, I think you deserve a little Mother's Day love. Hey Galadriel? What did you get Mom for Mother's Day? But what does that mean? If you live with someone, there better be a day off from doing pet chores! Someone to pick up the poop (I still want to walk Lulu, I just want someone to come up behind me with the poop bags). Someone to feed the pets. There's a lot bending down and picking up and I don't like how canned food smells. Clean the cat pan before I wake up. I want to wake up to a fresh smelling pan! Wash the dog! Nothing like a clean doggy. Day off from the rest of the chores so I can sit and enjoy my pets. My cute and august presence isn't enough? Try not to jump in any mud puddles or roll in any dirt, Lulu. Galadriel -- stop being a messy eater -- and a messy litter box user. Lulu, stop picking up stray items on our walk -- especially food! Galadriel, please stop clawing the new couch. And both of you -- be prepared for lots of love when I get home from BlogPaws. You know what I want? My Mom to come home from BlogPaws! I know this is kind of small thinking, but it's a starting point. So, what do you want for Mother's Day from your pets? I asked some pet bloggers that very question! See what they said, then tell me what you want below. CritterZone USA is one of the sponsors of the Lulu's Favorite Things Campaign, which raises money for Harbor House of Central Florida's Paws for Peace Walk. Thanks to the help of companies like CritterZone, we raised $500 for Harbor House. You can continue to help us raise money by going to the Harbor House website. I first learned about CritterZone last year at Global Pet Expo. I wrote a review you can read here. But keep reading below to find out how to get a coupon for $10 off one of these marvelous little units. What is CritterZone? It's a teeny tiny machine that it amazing at neutralizing odors in the room. It can purify the air in a room up to 800 square feet in size, not just for pet odors, but for allergens, bacteria, mold, and other awful smells. CritterZone says the machine creates a continual charged plasma flow that cleans the air. It energizes the air like what you'd find outside. It does emit a very faint ozone smell, but the unit's emission is below the FDA standard of .05 ppm. One cool thing the CritterZone can do is help remove the odor from pet accidents from carpet. The full instructions are on the CritterZone website, but basically after you clean the spot, place the CritterZone unit about six inches away and turn it on. Leave it for about half an hour to an hour. Check out this great video from CritterZone via YouTube. I saw this demonstration firsthand at Global Pet Expo last year. CritterZone literally took the ammonia smell out of ammonia. This is great if you're trying to get animals to stop marking territory, or if you have a multi-cat household and controlling the litter box odor is an issue. I wish I could show you the CritterZone ammonia test myself at home. I can't. I BROKE MY UNIT! But it does work amazingly well. CritterZone has a corded unit for the house, a wall plug-in unit for the house, and a portable pack with a car adapter. All of these units can be purchased on the CritterZone website. A standard unit costs $99, still cheaper than buying one of the big units through a place like Sharper Image. And it has no filter to replace. If you take care of it, it will last a while. AND, if you use the code "lifewithbeagle" when you buy your CritterZone on the website, you get $10 off. CritterZone also has a great blog where they offer pet tips and tricks for the home, plus news on their latest charitable works. Check out the post about Lulu's Favorite Things! The fine print: This post is sponsored by CritterZone USA. I am being compensated for helping spread the word about CritterZone, but we only share information we feel is relevant to our readers. CritterZone is not responsible for the content of this article.